In our third partnership with One Acre Fund, we’ll be following young farmer Christine Wasike and her family for an entire growing season. From planting to harvest, we will check in with Christine every month to learn about the choices and decisions her family must make as they seek to make a living from agriculture in rural Kenya. Christine Wasike taking some time out from her busy schedule! Christine Wasike had her first child at 17 years old. As a young wife who had quickly become a young mother, she needed to start caring for her budding family, and it was going to require some tough decisions. She says the day her now nine-year-old son was born was the day the choices began. Now 26, Christine and her husband, Martin, have three children of their own and also care for Martin’s young cousin. The family lives in a small, mud-walled home situated in Marakaru, Kenya. The rural village is named after the thorny flowers that grow along the dusty, dirt road that leads down to the river where Christine and her neighbors fetch water each day. Martin works in masonry, but the pay from his job alone isn’t enough to support his family. Christine, strong and stout, grew up farming with her mother. Since she and Martin married, she has planted a variety of vegetables every year with the hope of helping to contribute to the family’s finances. Unfortunately, for many years, Christine’s harvests were dismal. Christine Wasike with her husband Martin and their four children. As a young family living in a rural area, Christine and Martin faced regular challenges. With Martin’s low income and Christine’s harvests falling short of feeding their family through the year, tough decisions had to be made, often with high opportunity costs. The couple would often have to choose whether to spend their money on medical expenses, school tuition, or food. In 2007, Christine made a choice that would change her life. She chose to take out her first loan with One Acre Fund, a nonprofit social enterprise that works with smallholder farmers like her to increase their farm productivity and income. By saving the cash she would usually spend on her planting supplies early in the year, she was able to have enough money for critical expenses. Then, later in the year when her crops were mature enough to harvest or sell, she could pay back her loan in full. 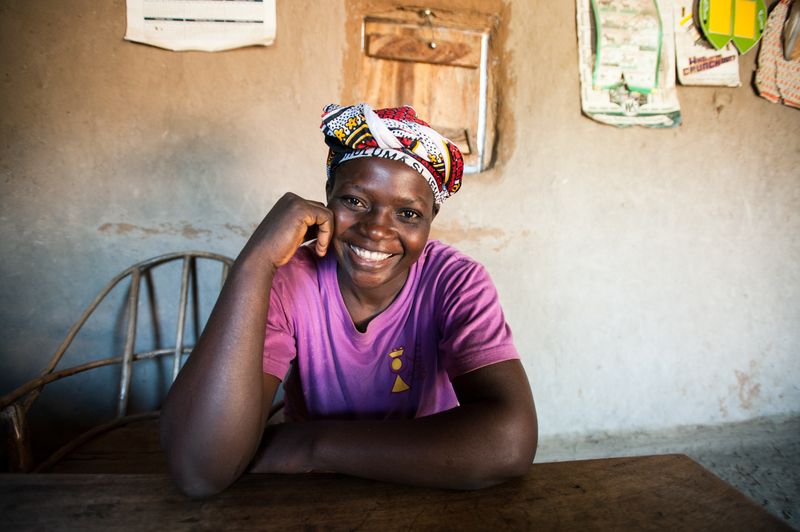 With agricultural trainings from One Acre Fund, Christine has been able to double her crop yields – and farm income. “I used to harvest about three bags of maize on a half an acre piece of land. Last year, I also planted on the same half acre piece of land, and I got seven bags of maize. I think I would have harvested even more were it not for the rain. It started out very well, but later it stopped, and this made it so I was not able to harvest as much I had anticipated,” Christine says. The increase she has seen in her yields since enrolling with One Acre Fund has had a very tangible impact on her family. Most importantly, it has meant that she and Martin have more choices to consider. Christine Wasike preparing her land for the next growing season. Early this year, Christine and Martin decided to put their youngest son, Jeremiah, now three years old, into private school. In Kenya, many families will send their children to a privately-funded school whenever possible since the public schools can be overcrowded and have little curriculum oversight. Jeremiah reading one of his school books. The decision to put Jeremiah in private school did not, however, come without trade-offs. “We had wanted to buy a cow, but we decided to put that on hold. At Jeremiah’s school, we pay 2,000 Kenyan Shillings ($21.71 USD) for the teachers. Then the registration fee was 200 Kenyan Shillings ($2.17 USD), and we also had to give the school 15 kilograms of maize and six kilograms of beans as payment,” Christine says. Christine is excited with the progress Jeremiah has made in his classes. She says she would like to keep him in private schooling, but that the decision to do so will be dependent on the family’s future finances and agricultural performance for the year. Check back next month to see the choices Christine and Martin face as they move into planting and Kenya’s rainy season. One Acre Fund serves 135,000 smallholder farmers in Kenya, Rwanda, Burundi, and Tanzania, helping them to increase their harvests and incomes. It provides farmers with a service bundle that includes seed and fertiliser, credit, training, and market facilitation, and enables farmers to double their income per planted acre. To learn more about their work, you can read Roger Thurow’s The Last Hunger Season.